Anyone got an idea what is attacking my laurel hedge. Help needed, here is a pic of the damage. Welcome Sb, I hope you meet lots of friendly and informative gardening pals here. 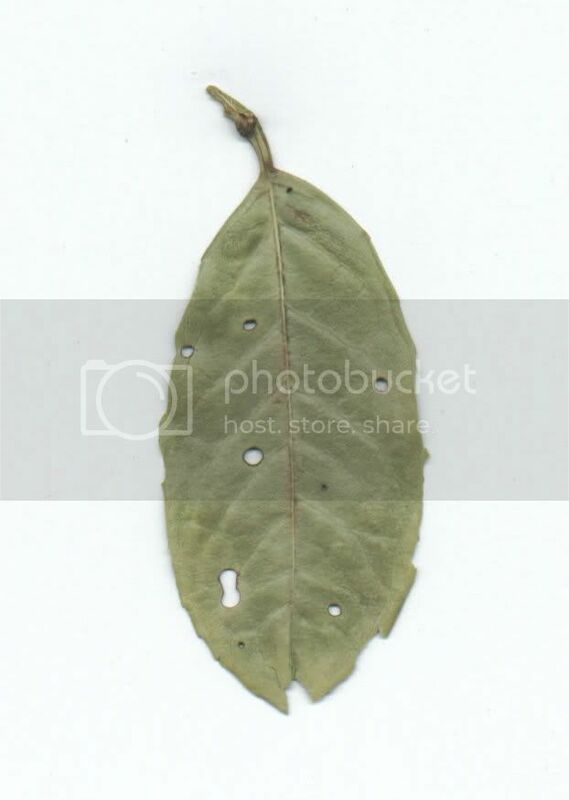 Well, after looking at your leaf samples it looks as though your laurels are suffering the effects of shot-hole disease. It appears as if someone had fired both barrels of a shotgun at the plant. The holes are round in shape as if created by pellets; they also have a slight browning around their edges. An insect does not cause these unsightly holes; so a pesticide spray is ineffective. They are in fact caused by a fungal or a bacterial / fungal infection that cause leaf tissue to die out in spots. A Rose-clear spray may help slightly as it contains a fungicide. However, Rose-clear also contains an insecticide that in your case you do not require, this insecticide may cause the death of beneficial insects if used when not required. -	Enforce strict garden hygiene around your laurels. Rake out and remove any dead leaves at the base of the hedge, destroy these at a safe distance away by burning. Also, remove any dead or badly damaged leaves on the plants and destroy these as well. Fungal spores may exist on these dead / damaged leaves and spread the disease through wind and rain dispersal. -	When pruning your laurel plants ensure you create clean cuts without ragged edges. The disease is more rampant on poorly pruned specimens. To prevent disease transfer between plants, you must wipe down your pruners with alcohol or surgical spirit before and after pruning. -	A laurel plant under stress will suffer more from the effects of shot-hole disease. De-stress your plants by keeping them well watered in dry spells and keeping them fed throughout the growing season. Apply a pelleted chicken manure once a season; this should be adequate if you have an open, friable soil but it is not effective in heavy, sticky clay soils. In that case, you could also try applying a foliar feed such as Phostrogen or Miracle-gro. -	A very effective chemical for use in the treatment of shot-hole disease is copper oxychloride. This is available in a product called Murphy's traditional copper fungicide. Apply this spray on a calm dry evening in mid-August, mid-September and again in mid-October. The effect of these procedures will not be immediately obvious; it normally takes around three years of care to halt shot-hole disease. So this is the laurels disease that I have seen in my neaighbors garden. Must tell him about it.